Images of the heavens shown on these pages were not painted by artists. These images are real objects that were photographed by several organizations across the globe. One reason that these images are so dramatic is that these images are recorded in different kinds of light. 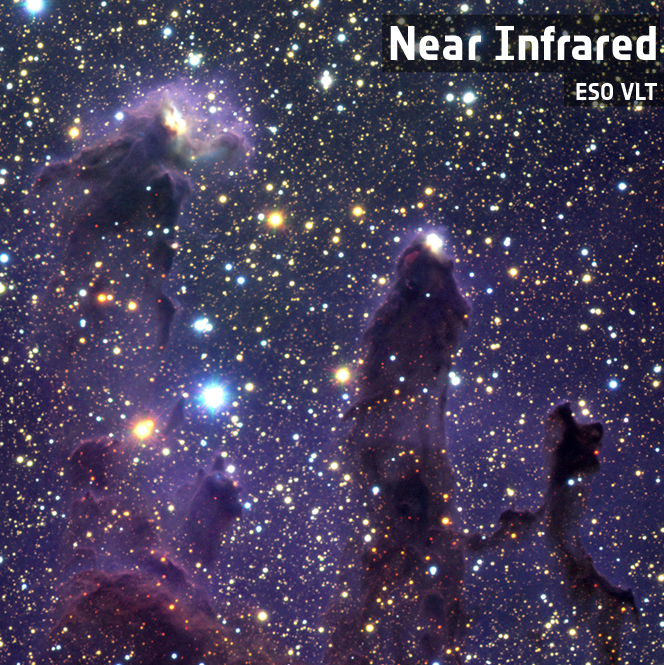 Modern telescopes can see formations in the Universe that our human eyes cannot see. What we do see is called "visible" light. Visible light is, however, only a tiny sliver of a much bigger picture, called the "electromagnetic wave spectrum". Light waves are a kind of electromagnetic radiation. We identify various bands of radiation by wavelengths. For example, visible light covers the electromagnetic band of 700 to 400 nanometers, while cell phones send and receive radio messages in the centimeter-wavelength band. The entire range of radiation wavelengths is called the "electromagnetic spectrum". The entire electro­smagnetic spectrum is a range of wavelengths from hundreds of kilometers, very, very long, to billionths of billionths of a meter, very, very short. Wavelengths that are longer than "red light" and shorter than "violet light" are beyond what our eyes can see. We often hear talk about "infrared" and "ultra­violet" light, neither of which humans can see; i.e. "in?visible light". Infrared radi­ation has longer wavelengths than visible light and infrared is perceived as heat by humans. Some species of insects and reptiles have infrared "vision". When one feels warmth from a fire, one is "sensing" infrared radiation from a fire. Ultraviolet light and all shorter wavelengths of radiation affect natural processes and ionize molecules, including the molecules of living things, thus "ionizing radiation". Although ultraviolet light is not visible to humans, we can see the effects of ultraviolet radiation, for example sunburn or the glowing (florescence) of florescent lamps. is annihilated and returns to the much more stable molecular oxygen (O2). The creation and annihilation of volatile ozone is a continuous process in Earth's upper atmosphere. Because ozone is an ionized molecule, the Earth's magnetic field influences the behavior of this oxygen—ozone creation and annihilation. At the Earth's north and south poles, the Earth's magnetic field concentrates, or focuses, high-energy ionizing radiation toward the poles; this shower of radiation comes from outer space and our Sun. Consequently, the atmospheric ozone layer at the poles normally fluctuates in size from season to season, from year to year, from century to century… and is heavily influenced by . One could hypothesize that any ionized molecules floating around in the atmosphere would behave at the Earth's poles in a similar manner. The longest wavelengths of electromagnetic radiation are in the neighborhood of 3,000 cycles per second (100 kiloHertz). Old-fashion AM radio broadcasting operates in a waveband around 1,000,000 cycles per second (one megahertz or 1 MHz; 300 km). Military submarines communicate with very long wavelengths around 80 cycles per second (80 Hz or 375 km). The figure below shows which wavelengths of radiation penetrate, or pass through, our atmosphere and which wavelengths are absorbed by our atmosphere. Wavelengths of radiation that are absorbed by the atmosphere, heat the Earth's atmosphere, while wavelengths that penetrate the atmosphere have a much, much lower affect on the atmosphere's temperature. Radiation from far-off galactic sources and huge eruptions of our Sun do not penetrate our atmosphere; cosmic radiation is absorbed by Earth's atmosphere and thereby heats the Earth. Then the question arises: Can scientists determine the contribution of galactic sources of radiation to global warming? The Earth's atmosphere blocks nearly all of the high-energy electro­magnetic spectrum that emi­nates from space and from our Sun. "Blocks" is a colloquial way of saying "absorbs". Radio wavelengths and nearly all visible wavelengths pass through Earth's atmosphere with little or no absorption. Infrared wavelengths are partially absorbed by our atmosphere. All other wavelengths of electromagnet radiation are absorbed by our atmosphere; absorption equates to heating Earth's atmosphere. This graphic is a simplified composition (by RBKOR) of the NASA version Notice that Earth's atmosphere is transparent, does not absorb nearly all radio waves, If radio waves did not freely pass through Earth's atmosphere, then radio and television broadcasting, much telephone and Internet traffic, Wi-Fi, remote controls, smart phones, radar, and Bluetooth would not be possible. Most, but not all, visible light passes through Earth's atmosphere unhindered. Because some light in the visible waveband is absorbed by the atmosphere, the sky is blue. At wavelengths in the ultraviolet band that are shorter than 124 nanometers (10−9 meters), we enter the realm of ionizing radiation. Ionization means that an atom has been forcibly stripped of one or more electrons. The ionization of atoms in living tissue causes alteration and damage to cell DNA, which means that ultraviolet radiation and all shorter wavelengths of radiation are hazardous to the health of all living things and can change the characteristics of non-living things. Ionizing radiation includes most wavelengths of ultraviolet light, x-rays, gamma rays, cosmic rays, and neutrons. Forttunately, 100 percent of all radiation at wavelengths shorter than the near-ultraviolet are absorbed by Earth's atmosphere. The nitrogen, oxygen, trace gasses, and perhaps all industrial polutants, including ozone, in Earth's atmosphere absorb incoming high-energy, ionizing radiation; life-threatening radiation is blocked by our atmosphere from reaching the surface of the Earth. Absorption of this "energetic" radiation warms the Earth and reduces the range of surface temperatures between night and day. Ionizing Radiation: All wavelengths of electromagnetic radiation that are shorter than almost-visible (longer than 400 nanometers) ultraviolet radiation, about 120 nanometers, are described as "ionizing" radiation. Ionizing radiation is pro­duced by atomic process­es, rather than molecular process­es, i.e. "chemical processes". In other words, the interaction of +protons, 0neutrons, +positrons, and in some cases −electrons produces ionizing radiation. Exposure to ionizing radiation can change a chemical element into another element, which in turn stealthily changes the chemical behavior of molecules, ergo illness. Ionizing radiation means that ultraviolet radiation, as well as all shorter wavelengths, can damage DNA and affect living cells by breaking the weak chemical bonds of which much living tissue is made. All radiation having wavelengths longer than ultraviolet light are described as "non-ionizing" radiation, which means that exposure to long-wavelength radiation is not hazardous to our health, unless a person is prone to doing unreasonable things; for example, looking directly into bright sunlight for long periods of time, which will assuredly do considerable damage to one's retinas. Another example of being unreasonable would be a person irresponsibly putting their hand into a blazing fire. When reasonable behavior is the norm, long-wavelength radiation is not hazardous to one's health. A Practical Note: Cell phones and microwave ovens operate at millimeter wavelengths, which means that these devices should not be a health hazard, because these wavelengths of radiation are not energetic enough to ionize the molecules of living tissue. Research papers have been published in recent years suggesting that harm to humans can result from using cell phones and microwave ovens. One could, perhaps, avoid drawing premature conclusions that seem to violate the laws of physics. We should reiterate at this point that cell phones, microwave ovens, Wi-Fi, Bluetooth, radio and television broadcasting, automobile remote controls, computers, satellites, and radar systems operate at wavelengths quite a bit longer than visible light and, therefore, should not be hazardous to our health if used sensibly. For example, not putting your hand into an operating microwave oven or into a campfire; indiscretions that can be quite harmful to one's health. All electro-magnetic radiation shorter than extreme purple light is ionizing radiation, which is harmful to the health of all plants and animals. The decay of uranium terminate a person's life by severely damaging a person's DNA. Ionizing radiation is invisible, silent, and can do damage at a distance. One only has to be in the proximity of the source of ionizing radiation to suffer illness or death. Although we normally think of radiation as being bad, a hypothesis is beginning to emerge that suggests that small micro-doses of ionizing radiation may actually help our immune systems to work well; the process is referred to as hormesis, which could also be the mediating force behind mutations that drive the process of "survival of the fittest". If these ideas seem to be completely crazy, then consider that cancerous-tumor irradiation with radioactive cobalt 60 (Co60) is a common therapeutic procedure. Ultraviolet light is used to detect counterfeit paper money, artwork forgeries, and fake credit cards. Disco dancers are familiar with so-called "black light", which is a mixture of purple light and ultraviolet light. Although invisible, the ultraviolet light changes our view; things look different when illuminated by ultraviolet light. Unlike humans, mosquitoes can see ultraviolet light. Mosquito zappers attract mosquitoes with ultraviolet light. As the mosquitoes fly to the source of the light, they are electrocuted by high-voltage electricity. "Sanitary lamps", which emit ultraviolet light, have been used in public rest rooms to kill bacteria. 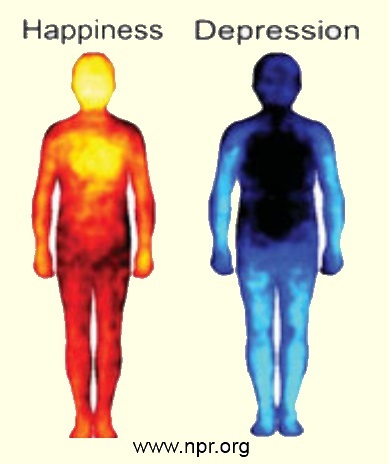 Compare these whole-body images "happiness" and "depression": Infrared photo?graphy reveals activity in living organisms. Yellow indicates the hottest temperature and light blue indicates the coldest temperature Images by USA, PBS. Infrared light is used by remote control devices to communicate a user's choice to the television receiver or music player. Soldiers and rescue workers use infrared goggles to see in the dark. Rattle snakes find their prey at night by "seeing" in the dark; in addition to a pair of eyes that see "visible" light, rattle snakes also have a pair of "eyes" that sense infrared radiation, which is also known as "heat". A Magnetic Storm on Our Sun: The loop of plasma (extremely hot, lectrically conductive gasses) extending beyond the Sun's surface reveals a magnetic storm. Our Son, as well as all of the stars in the Universe, are quite violent places. Surface features of the Sun are constantly changing and eject intense fields of radiation across much of the electromagnetic spectrum. If these ejections are pointed at the Earth, which they usually are not aimed, much of our earthly electronics would be damaged or destroyed. Our Sun displays several re-curring, periodic events, namely sunspots, magnetic storms, and massive ejections of hot gasses and atomic particles. Our Sun is a cauldron of extremely hot gases where hydrogen atoms fuze, making helium atoms, a process known as "fusion". 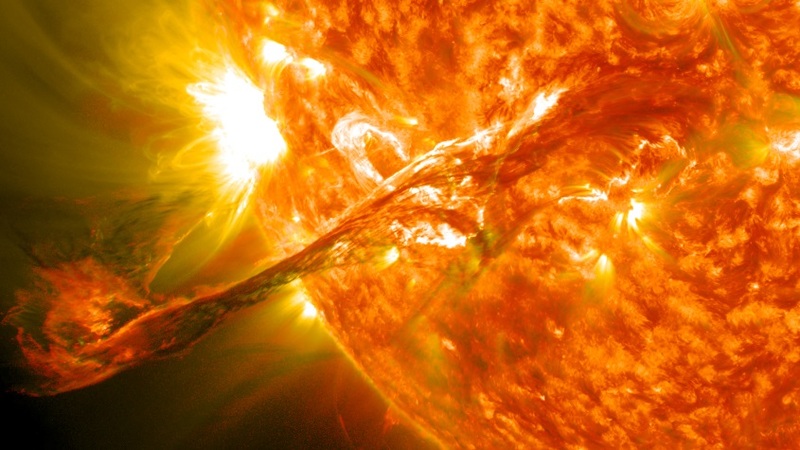 Photo by NASA US Solar Eruption: Solar energy is driven by a process known as "fusion". If, or probably when, we can tame the fusion process here on Earth, an inexpensive, clean, nearly limitless source of energy will become available. Slightly more than half of the total energy from the Sun that arrives at the Earth is infrared energy. Much of that infrared energy does not penetrate our atmosphere, but rather, is absorbed by the atmosphere, producing heat; heating of the atmosphere by absorbing incoming radiation is called the "greenhouse" effect. In addition to radio waves, infrared waves, and visible light waves, our Sun also bombards our Earth with ionizing ultraviolet rays, x-rays, and gamma-rays. These ionizing wavelengths are also absorbed by Earth's atomosphere and contribute to Earth's warmth. Long-wavelength radio waves and visual-light waves, however, do not heat the Earth's atmosphere, because the atmosphere does not absorb them. The amount of the Sun's radiation that heats the Earth periodically varies . Our Sun periodically experiences several phenomena that vary the intensity of heat-producing radiation: magnetic storms, sunspot activity, and volcanic-like ejections of highly energetic particles in the form of x-rays and gamma-rays, which all affect Earth's atmosphere. Note that a difference exists between nuclear "fission" and nuclear "fusion". All of the world's current nuclear power generation is based upon the "fission" process, where uranium and other heavy elements decay to lighter elements. "Fusion" on the other hand is a class of nuclear reactions where light elements, e.g. hydrogen, combine (fuse) to form heavier elements, e.g. helium atoms. 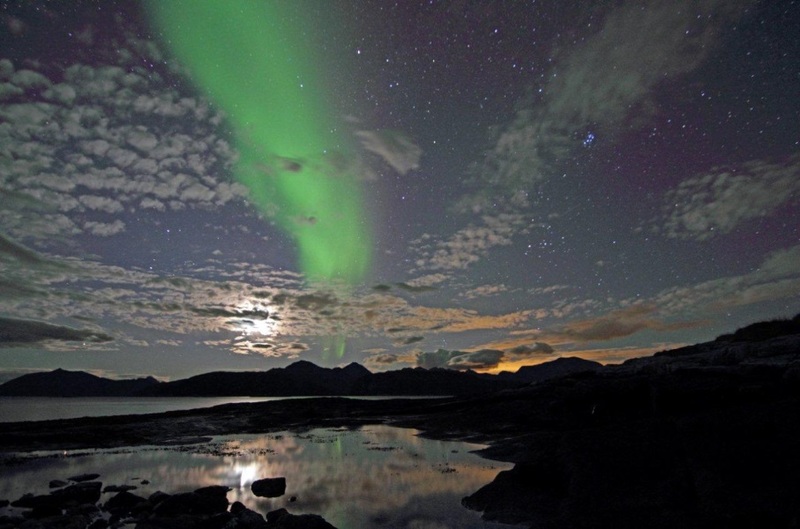 Aurora borealis was photographed by Frank Olsen at Hillesoy Island, Norway on September 2011. The bright Moon is covered by fluffy clouds. Light from the city of Toronto casts an orange glow along the right-hand horizon (Wikimedia Commons). Effects of this high-energy barrage of radi­ation from space can disrupt radio, satellite, and telephone commu­nications and pro­duce the spectacular light shows in the sky, otherwise known as "aurora borealis" in the northern hemisphere and "aurora australis" in the southern hemisphere. Most of the patterns are green, but some auroras display red or yellow as well. Recently, some speculation is beginning to circulate that the source of energy for lightning flashes is incoming cosmic radiation. One might also note that when flying at 30,000 feet, we are exposed to higher doses of cosmic radiation than the dose we would receive on the ground. 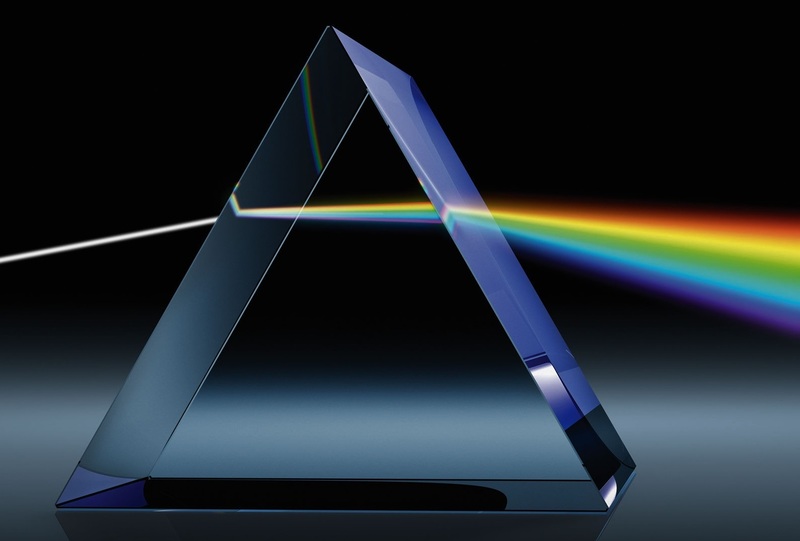 Expanding Our View: infrared, plus visible, plus ultraviolet together are still only a sliver of the entire "spectrum" of electromagnetic waves that exist. Physicists tell us that light travels in waves that have both magnetic and electrical characteristics; therefore, we use the terms "electromagnetic waves", or "electromagnetic radiation". In everyday language, the terms are equivalent. The Crab Nebula observed in different radiation wavelengths: optical radiation (human vision), infrared radiation, radio-frequency radiation (much longer wavelengths than optical), and x-rays (much shorter wavelengths than optical) (Annotations by RBKOR). Humans looking into the evening sky can see the image labeled "optical". A rattle snake might see the Crab as shown in "infrared" and one's earthly cell phone might receive celestial signals in the "radio" view. In having x-ray vision, Superman can see the "x-ray" view. Fortunately, modern telescopes can see much more than what our human eyes can see. Most of us are familiar with ocean waves; if you watch waves, you observe different distances between moving waves. The distance between the peaks is called a "wavelength". Electromagnetic radiation is also measured in wavelengths. Light is one kind of electromagnetic radiation, along with waves of other kinds of radiation: i.e.radio waves, microwaves, infra-red light, ultraviolet light, x-rays, gamma rays, and cosmic rays. Wavelengths: Radio waves have the longest wavelengths, measured in meters to thousands of meters (103. Broadcast AM radio and ship navigation aids continue to operate at these low frequencies, i.e. long wavelengths, despite the increased use of much higher frequencies nowadays. Over-the-air television and FM radio are transmitted at meter (101) wavelengths. Microwaves, used by radar ovens and for cell-phone communications, are measured in centimeters (102) and millimeters (103), while infrared waves are measured in micrometers (106). Visible light and near-ultraviolet waves are measured in nanometers (109). Ionizing ultraviolet rays and x-rays are measured in picometers (1012. Beyond x-rays, gamma rays and cosmic rays are microscopically short. Gamma rays and cosmic rays are usually associated with atomic-level nuclear processes and are decidedly destructive of living tissue. Because of the destructiveness of gamma and cosmic radiation, astronauts and the electronic components used in spacecraft must be shielded from these highly penetrating and destructive forms of radiation. High-intensity waves at a variety of wavelengths from many cosmic and solar-system sources continually bombard the Earth's atmosphere and sometimes interfere with radio and television broadcasting, interrupt some types of telephone service, and create grand auroral light displays, usually in high-latitude skies. Unusually intense bombardment of Earth's atmosphere by exotic solar emissions may have a connection to global warming. Future research and rigorous evaluation of available data may eventually clarify the causes and cure for global warming. The blue plume on the left of the crescent is a vol?canic eruption. 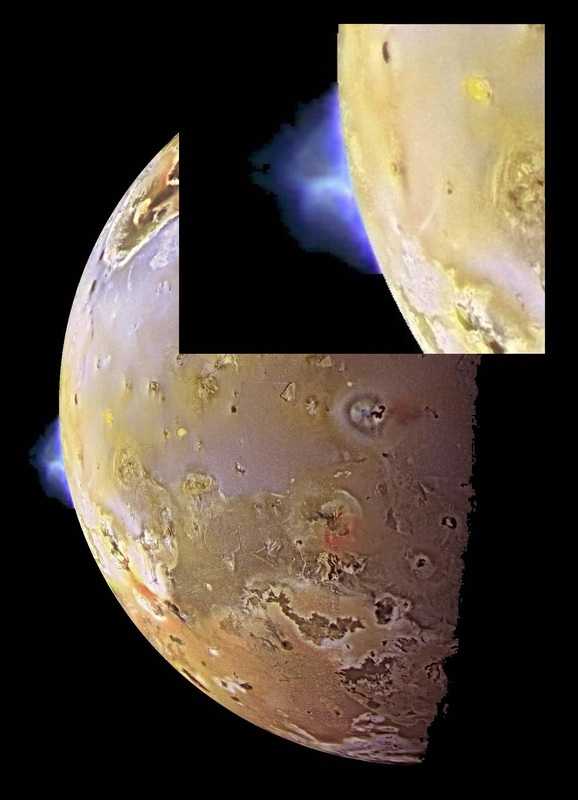 Vol?canic activity on Io was first detected in 1979 by spacecraft Voyager I, followed by several more spacecraft. As of this posting, more than 150 active volcanoes have been discovered on Io and as many as 400 are expected to be found. "Io" [ah-ee_oh] is one of the four large moons of the very large planet Jupiter that were discovered by Italian astronomer Galileo in 1610. Through Galileo's simple telescope, Io was merely a smudged point of light. 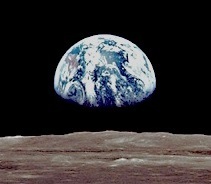 Nowadays, however, space-vehicle cameras record much fine detail. Io is slightly larger than Earth's Moon. Earth is about three times the diameter of its Moon, while Jupitor is 33 times larger in diameter than Io. A highly abundant chemical element on Io is yellow-colored sulphur (chemical symbol = "S"). On both Io and Earth, volcanoes spew out noxious sulphur dioxide (SO2). Sulphur dioxide is used on Earth to preserve the color and freshness of dried apricots and in the sulphite form [SO3], as a preservative for some wines. Bubbling SO2 through water produces the very strong acid, sulphuric acid (H2SO4), that is used in automobile batteries. The surface of Io is illuminated by light from the Sun. In sunlight, Io's surface appears in an array of colors, depending on the temperature of the surface sulphur: from black (the hottest) to bright orange to yellow to white (the coldest). The range of colors visible in this photograph of Io indicates that the surface temperature of Io varies across a wide range of temperatures. Exploration, whether here on Earth or across the cosmos, is always an invitation to surprises. 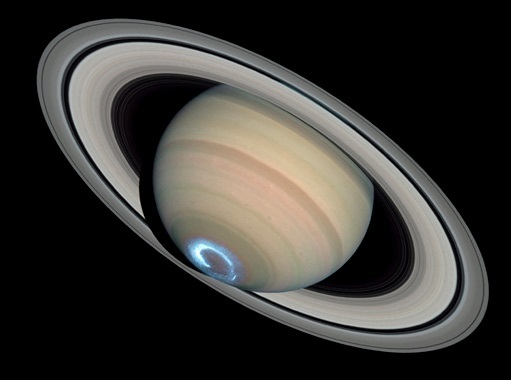 Until the late-17th century, astronomers had been aware of only one ring of Saturn. A closer look at the rings by larger and larger telescopes, however, revealed more rings. Space-vehicle telescopes revealed still more rings. Some of the more recently discovered rings were really groups of several thinner rings that were not visible when observed from Earth. Saturn is famous for its rings, but Saturn also has 62 moons (53 are named), the largest number of moons of any planet in our Solar System. 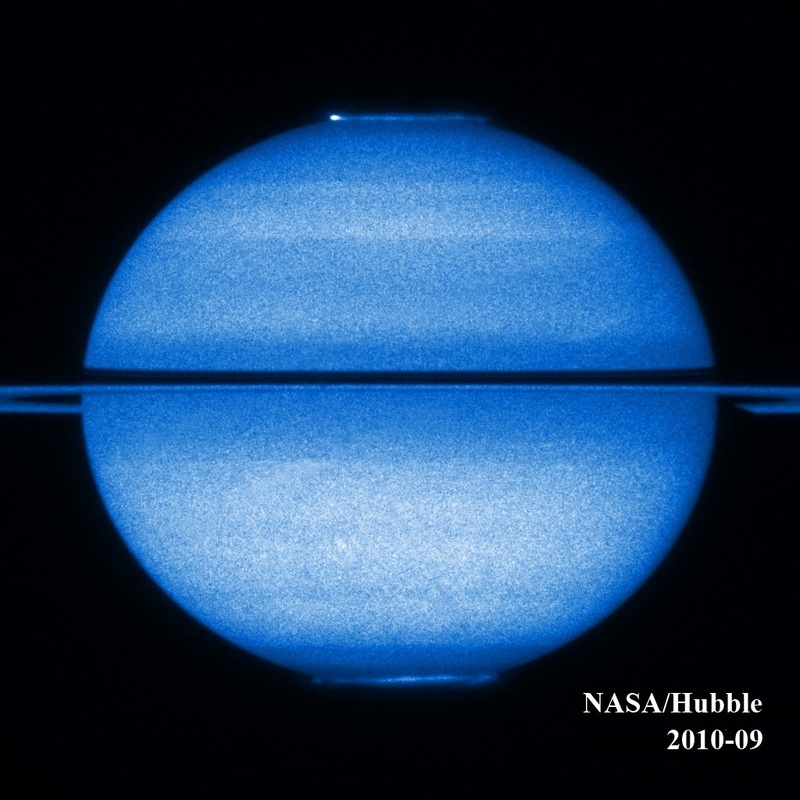 Although Galileo in 1610 was the first person to perceive structures beyond the planet, Christiaan Huygens in 1655 was the first person to suggest that Saturn was surrounded by "a ring". In 1675, Giovanni Domenico Cassini determined that Saturn's ring was composed of multiple, smaller rings with gaps between them. As recently as 1980, Saturn's outermost E-Ring was first observed and photographed by both Pioneer and Voyager spacecraft. Saturn completes an orbit around the Sun in 30 earthly years. Saturn, like the Earth, is slightly tilted on its rotation axis; consequently, Saturn's rings seem to briefly disappear as the planet biannually crosses the plane of the Sun's orbit, called the ecliptic. The E-Ring, the outermost ring of Saturn, is unique. Rather than being composed of rocks and other solid debris, as are the other rings of Saturn, the E-Ring is a misty blend of sodium chloride crystals (NaCl, table salt), silicates (SiOX; i.e. sand and quartz), ammonia (NH3), and water vapor (H2O) all mixed with a little mineral dust from Saturn's moon, Enceladus. Interestingly, these chemicals are among the basic building blocks of bio-chemistry.Saturn's E-ring was discovered by NASA's Pioneer 11 spacecraft as Pioneer passed by the ringed planet (6 April 1973). The Eagle Nebula is about 7,000 light years away from the Earth. 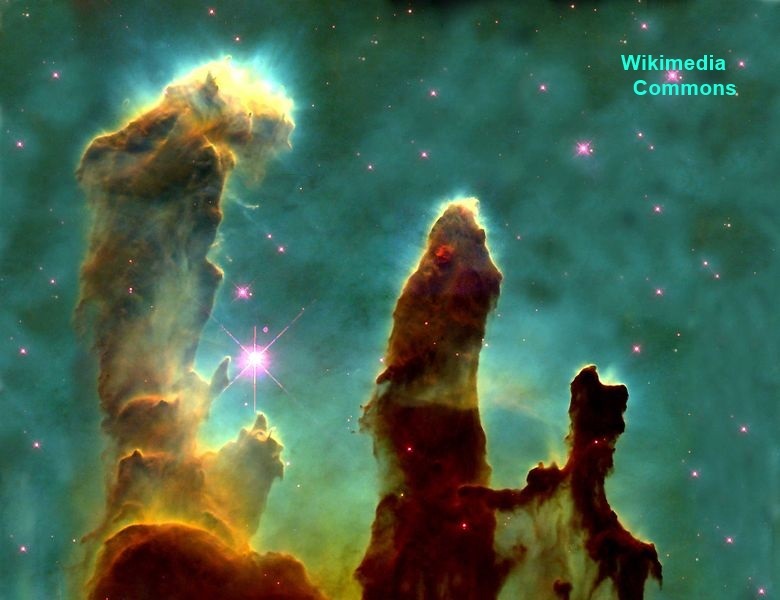 The largest pillar is about four lightyears high. The green color observed in visible light is ionized hydrogen. The Eagle Nebula: This cloud of dust and gazes is also known as M16, NGC 6611, and the Star Queen Nebula. "Pillars of Creation" and "Star Queen Nebula" refer to the exceptionally copious creation of new stars in this region of the sky. The bright color indicates ionized hydrogen, which indicates the presence of high-energy radiation fields that excite the hydrogen atoms with a substantial amount of ultraviolet radiation. A region of space having these conditions, i.e. lots of hydrogen being bombarded by intense ionizing radiation, are the primary ingredients for creating new stars. The dark columns of cool interstellar hydrogen gas and dust are the birthplaces of new stars. That is a lot of information derived from the visible color of an object! When viewed in non-visible electromagnetic wavelengths, e.g. ultraviolet-rays and x-rays, even more information is gathered about an object. The study of modern astronomy has gained much from developments in astrophysics (perhaps we can say, "theoretical physics") and has given humans a host of opportunities for developing new places to live in our Solar System, as well as, learning more and more about our own Earth. The more we know of our environment, the better our lives will be… hopefully.